Darren Kelly - the former Derry City and Portadown player - is aiming to guide Hyde United to FA Cup glory tonight over MK Dons. Pic courtesy of Hyde United FC. Darren Kelly has developed something of a regular working routine across the past 18 months as manager of Hyde United. Most Monday, Tuesday and Thursday mornings have been defined by 100-plus minutes of travel time from his York home to Ewen Fields. Having used the journey to help shape his goals, subsequent work on the training ground built around the twin pillars of sweat and statistics is steered towards securing matchday success. At Hyde - following managerial experiences with Halifax Town and Oldham Athletic which proved short in tenure but long in life lessons - Kelly has found stability. A familiarity which has become the foundation of the club’s record-breaking rise up the Northern Premier League’s Division One North in stark contrast to three consecutive relegations suffered ahead of his appointment as manager last summer. That faith in the fundamentals, a revolution of sorts via repetition, has allowed Kelly to inject Hyde with high hopes of sustained success thanks a core belief in the importance of time. But irrespective of how much trust Kelly puts in the power of patience, he understands that one high-profile reward for that progress will arrive tonight (Friday) when Hyde can transform the fortunes of the club on and off the pitch across 90-plus minutes of football. MK Dons arrive in town to tackle Hyde in front of the BBC Sport television cameras for an FA Cup first-round clash blessed by the potential for another addition to the competition’s proud history of knockout magic. Kelly’s playing career featured multiple cup triumphs in the colours of hometown club Derry City and Irish League side Portadown. Now, having lifted silverware thanks to efforts on the pitch as a player, Kelly is hoping to mastermind another golden cup memory from the other side of the white line. 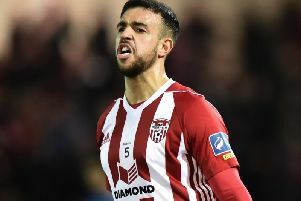 “I have had some of the best moments of my career in cup football with Derry City and Portadown and you can see the buzz is something really special leading up to this tie with MK Dons,” said Kelly. “The interest in the match is amazing for everyone connected to the club. “When I arrived our crowds were around 100 and now we get up to 1,000 for league games, with 3.500 fans expected in the ground this week. “They anticipate when everything is taken into consideration that the tie will provide the club with an extra £140,000, which is significant as our annual budget is probably around £120,000. “Cup football is something different, with those extreme highs and lows compared to the marathon of a league campaign. “We have had to get past five previous rounds to reach this point and no-one is expecting us to do anything in the match. “MK Dons would be ranked five leagues above us to begin with but you always have hope and we focus a lot as well on those fine margins which can make all the difference. “Teams do not like playing on our 3G pitch but we know every bounce and feel and it is going to be such a big night for the club, so you always think about the giant-killing magic of the FA Cup. “However, I am also a big believer in being as professional as you can and we take great pride in the hard work put into all aspects of the club. “I feel that attention to detail has been a big part of our progress and we have only lost three times at home since I joined the club. Kelly is embracing the mix between modern and traditional football provided by life at Hyde. “I have wonderful support from the committee and everyone around the club, with that long-term view granting me the time to put ideas into place and get everything across to the players,” said Kelly. “We have sports science staff and can look at data on performance levels and everything, with excellent scouting reports coming in on the opposition. “So that stuff is exciting and a great help towards the attention-to-detail approach I relish. “However, we are also dealing with part-time players so I can call on my experience of time back home to understand the difficulties guys face juggling the responsibilities of work and home life with the football commitment we ask. “But it is a such a great changing room and that togetherness gives me confidence we can move forward. “In terms of standard, our league level would be comparable and some players would do really well. “I still check on the scores back home. “One big difference is the way the registration works and we only have maybe six or so players on contracts. “If I want to sign a player there is a seven-day rule. “That means I give notice of my approach to the player’s club then I can sign him on the eighth day.